This week's #SundaySupper event is a DIYers dream. 'Gifts from the Kitchen' is the theme for the event, so we're sharing recipes for homemade holiday presents. I've made and think these would make great gifts, too: Salted Caramel Sauce, Gin-Drizzled Gravlax, Cranberry-Clementine Infused Gin, Stone Fruit Jams, and Quick Pickled Asparagus. 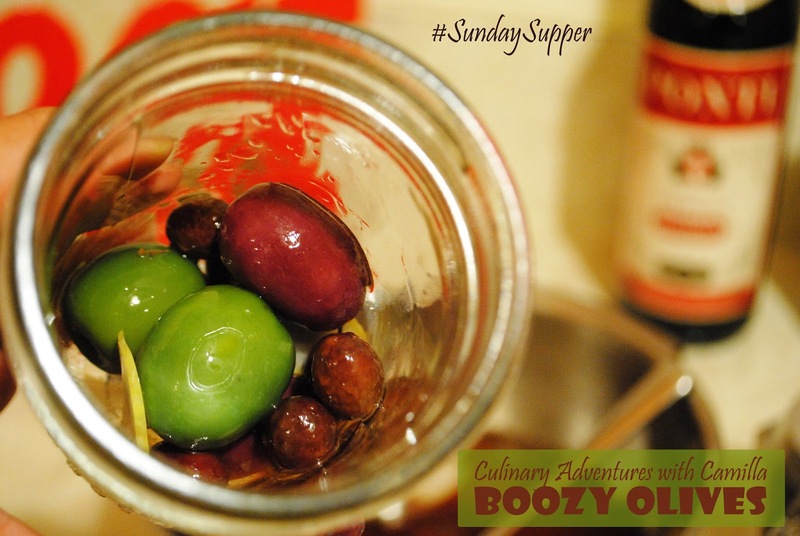 But today, I'm sharing a recipe for Boozy Olives; I had intended to make Homemade Cocktail Onions, too, but life has been more chaotic than usual and I am still between two kitchens. I'll post the cocktail onion recipe later. For the olives, go for a variety of colors. I used the green Castelvetrano, purple Alfonso, and black Niçoise. Be forewarned, this recipe takes 2 weeks to age; so, make them now to have them ready in time for the holidays. Cheers! Combine all ingredients plus 1 C water in a large mixing bowl. Make sure the olives are completely submerged. Let stand for at least 2 hours. Divide into smaller jars. Pour the liquid over the olives. Cap the jars. Wait 2 weeks and enjoy. Here's what the rest of the crew made...I have so many things on my to-make list now! Totally inspired. I making this just as a gift to myself (and maybe some other folks too). I can already taste a martini made with these olives. Oh yes! I know, right?!? It's 5 o'clock somewhere. I couldn't get here fast enough to check these out. I am a traditional martini gal. No fruits or fluff, just a straight up dry martini on the rocks with an olive or two. 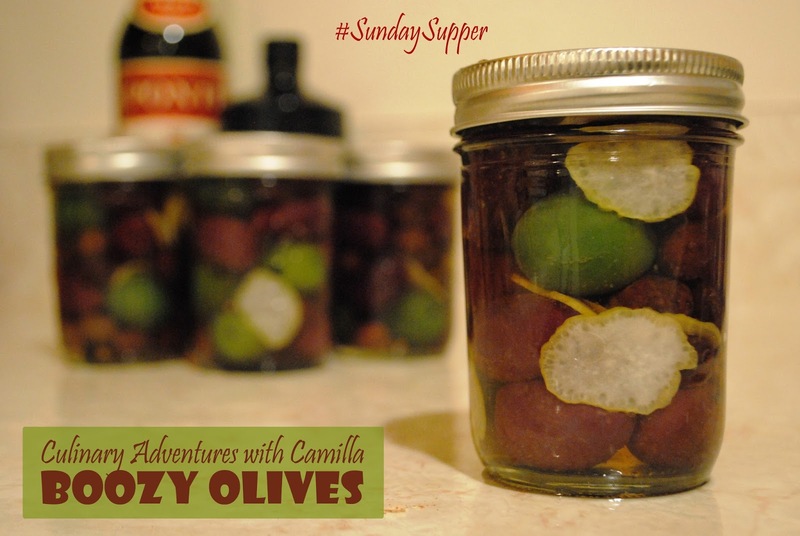 I have to make these olives for sure, great recipe!! Yep. I'm a plain jane martini gal myself. I love all things olives! It is like the trifecta of goodness. I can't wait to try this out. Yum! I like that "the trifecta of goodness." Wow! What a great gift idea! So creative! Thanks! I need to make more. Oh, my gosh, I need to make a batch for my dad ASAP! What a terrific hostess gift, too. And so, so easy, Liz. Your gift would definitely put friends and family in good spirits, Camilla! Tee hee =) Seriously, delicious looking and sounding! OMG! These are drool worthy! 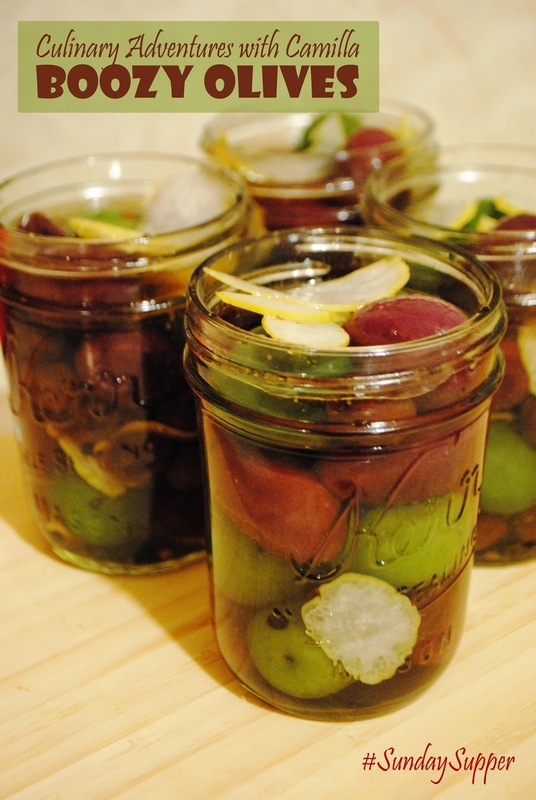 Booze olives- these will be on my holiday table this year! Booze and olives - my two favorite things!! Ooh boy, I;d better start this now! I'd love to try these with sharp cheese! I would never thought to mix olives and alcohol. What a fun treat! So, if I ate the entire jar in one sitting, would I be intoxicated? It's a fair question, because I think that's what would happen if I were gifted a jar of these beautiful olives. What a terrific unique idea, I love it!